How much parity is there in American sports? American sports are known for their parity, with their draft systems adept at giving the worst franchises a fighting chance with the cream of the crop of the newly graduated college student athletes. Salary caps prevent the richest teams from securing the services of all the very best players, meaning each team can try and have a superstar player within their salary cap (MLB does not have a salary cap but a luxury tax does largely the same job). To measure parity within the leagues, TSZ measured how many different (unique) teams have appeared in the finals of each respective sport over the past 11 seasons. 11 seasons was chosen because doing the past 10 years would discount both the NBA and the MLB due to fewer seasons played (10 vs 11). 11 seaons allows the data to be gathered fairly and irrespective of when in the year the season runs. 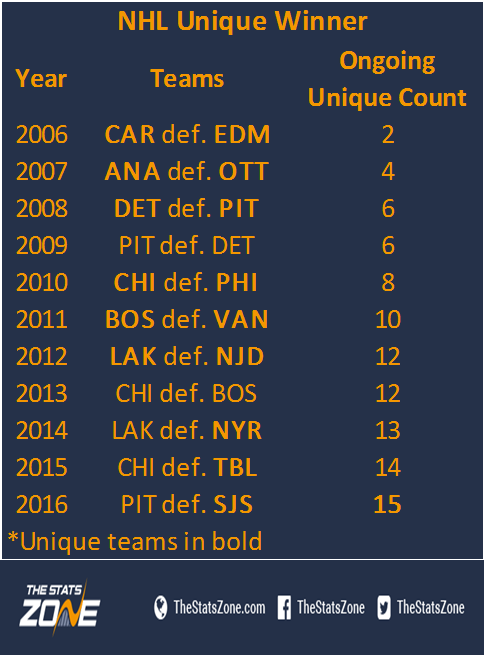 15 of 30 NHL Teams have been to a Stanley Cup Final since 2006. 9 of 30 NBA Teams have been to an NBA Final since 2006. 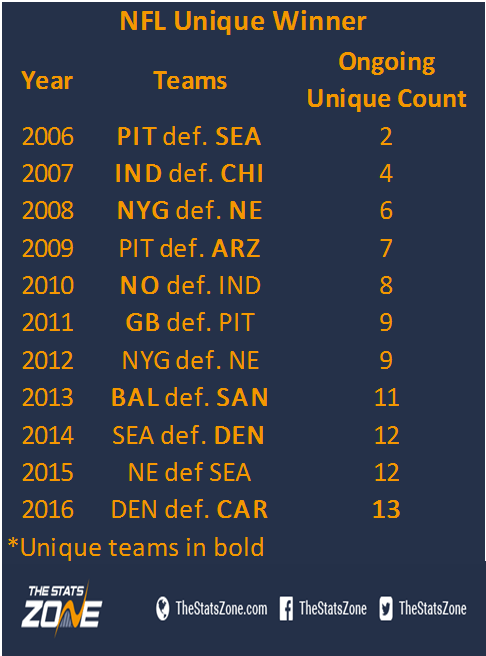 13 of 32 NFL Teams have been to the Super Bowl since 2006. 13 of 30 MLB Teams have been to the World Series since 2006. 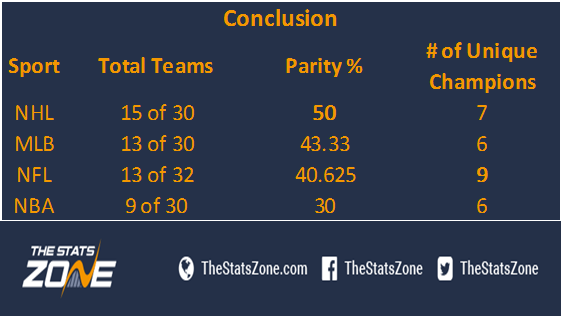 The NHL has seen the greatest number of teams appear in the final, with half of the league fighting for the Stanley Cup at least once in the previous 11 seasons. The NFL leads the way with the greatest number of unique champions, most likely due to being the only finals which is a single game: this allows plucky underdogs like the New York Giants in 2007 to spoil the New England Patriots' perfect season with the famous one handed catch against the helmet during the game-winning drive. The diverse National Football Conference (NFC) can be thanked for the NFL's parity, with eight of the 16 NFC franchises making an appearance in the Super Bowl. The Philadelphia Eagles, Atlanta Falcons, Tampa Bay Buccaneers, St. Louis Rams, Washington Redskins, Dallas Cowboys, Detroit Lions and Minnesota Vikings have failed to win the NFC Championship Game to book their spot in the Super Bowl since 2006 and only the final four have failed to appear in the NFC Championship game in that time period. Of that quartet, only the Lions are yet to compete in the Superbowl in their history. However, in the AFC, only once has the AFC Championship Game not been won by either Peyton Manning, Tom Brady or Ben Roethlisberger (Joe Flacco with the Ravens in 2012). The other finals are a best-of-seven and the play-offs in the lead-up to the finals largely follow a similar format, with the MLB using a range of one game, and best-of-five and seven game series before the best-of-seven World Series. It must be noted that the NBA could have a seventh unique champions, should the Cleveland Cavaliers beat the Golden State Warriors in the current final.